This heat iron melts the keratin bonds properly and therefor it doesn't take hold in the natural hair. The heat iron is teflon-coated and should be cleaned only with a damp cloth. 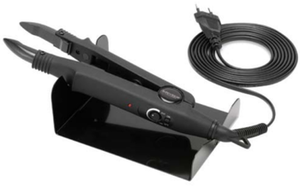 A metal stand is included with the heat iron.